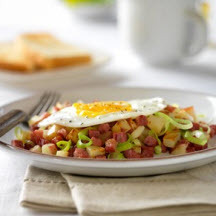 The day after St. Patrick's Day, use up all that extra corned beef in this savory breakfast hash. Bring water to a boil in a large saucepan; add salt and potatoes. Return to a boil. Cook 5 minutes; drain well. Melt 1 tablespoon of the butter in cast-iron or large heavy skillet over medium-high heat; add onion and peppers. Cook and stir 2 minutes or until tender-crisp; remove from pan. Add corned beef, potatoes and parsley to onion mixture; mix lightly. Combine half-and-half, wine, mustard and pepper; add to corned beef mixture and mix well. Wipe out cast-iron skillet with paper towel; place over medium heat until hot. Add remaining 1 tablespoon butter. Add corned beef mixture, pressing down firmly. Cook hash 15 minutes or until browned, turning with flat spatula several times. If desired, top individual servings with poached or fried eggs. Recipe and photograph provided courtesy of Beef, It's What's For Dinner©.